The exhibition will present the collection of Soviet arcade machines from the Cold War-era as a cross cultural leisure phenomenon shaped by political priorities. 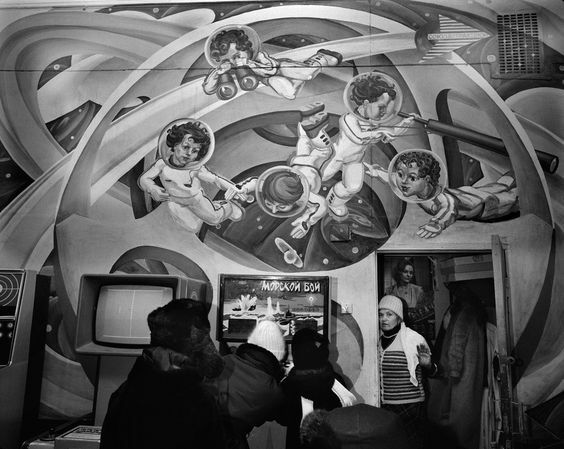 The Cold War competition was reflected in both Eastern and Western cultures through music, movies, books, television and other media, as well as sports and public entertainment, social beliefs and behavior. Advancements in space technology, development of nuclear weapons and athletic achievements as a proxy for political potency affected mass production and daily routines. Personal toys, playground equipment, amusement rides and arcade machines constructed during the Cold War was intended to foster children and teens’ curiosity and excitement about their future roles as fighter pilots, submarine sailors, sports champions and space colonists. From the mid-seventies up to Perestroika 22 military plants in U.S.S.R. were producing ‘Sea Battle’, ‘Air Fight’,’Torpedo Attack’, ’Tank Battle’, ‘Sniper’ ‘Motorcycle Rally’, ‘Ice-hockey’ and over 100 other types of arcade machines based on American and Japanese inventions. In its socio-historical and ideological context Soviet arcade machines get the symbolic value by reflecting the essential Soviet attitudes, namely, socialist emulation and speeding up time. The romance of Soviet youth came up not from the individualist rebellion or acceptance of life’s challenges cultivating personal identity, but from the experience of the living in a dream that came true, being a part of the collective realm filled with everyday miracles and triumphs. The exhibition will present more 18 arcade machines suitable for use by visitors and complemented by other exhibits, including consumer objects, archive photographs, extracts from feature films, cartoons and documentary that describes the specifics of leisure and recreation activities in Soviet times. The exhibition could be opened starting from May for 2 – 4 months.